These are absolutely adorable and my daughter used the one for her new baby in his 1 month photo. I purchased one brown and one cream for brothers and I think they are very cute! Our super cuddly Mocha Bear by Aurora Plush measures 12" and looks adorable in this comfortable sweater. This embroidered bear has the wears a warm and cozy sweater in either white or red, you chose! We include free personalization of any name in contrasting thread color, plus free gift wrapping and a personalized message card, too! PERFECT! My grandson loved his bear. Additional Details Because this design is design by you, it creates a wonderful gift for all occasion. 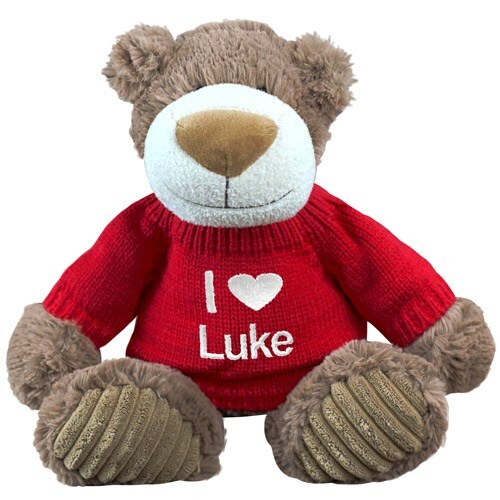 Be sure to view our entire collection of Embroidered Plush Animals to find great Romance Bears for your sweetheart.